D.A.D.S. National uses donations and funds from sponsorships to finance outreach and welcomes national sponsorship opportunities. Local D.A.D.S. chapters build programs and events that benefit individuals with Down syndrome. 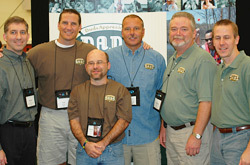 If you are looking for an organization to sponsor, or you have an event that you would like to benefit D.A.D.S. National or a D.A.D.S. chapter, please contact us.